Tumkur Road, the lifeline of Bangalore! Tumkur Road which was considered a village as it was located in the outer region of the city, has now transmuted into a part of the city credits to its speedy growth in real estate sector. Tumkur Road is one of the evolving belts emerging to the north-west of Bangalore. It has airport to the north, this belt has helped from the dynamics of location as well as accessibility. Escalation of the highway has aided in smooth travel through the Outer Ring Road (ORR). The upgraded elevated Tumkur Highway links to Nelamangala. The impending Bangalore to Mumbai Industrial Corridor connectivity to the airport and the ORR have all worked in favour of this belt. Easy connectivity to main locations gives a boost to it. Since it is a large, developing industrial hub with land parcels, there is a sudden growth of this micro-market. The anticipated Bangalore-Mumbai Industrial Corridor is expected to link to two super sities of the nation Bangalore City to Mumbai port, benefitting the industrial activity of Tumkur Road. It is conveniently located close to Nelamangala-Bangalore Expressway, forthcoming Hesaraghatta Cross metro station and Yesvantpur railway station have upped the standards of Tumkur Road with an exceptional connectivity and good availability to all over the city. It has gone through a complete makeover henceforth making it a worth living place.Therefore it is indeed a blessing for the city Bangalore as it boasts of the rich locality. 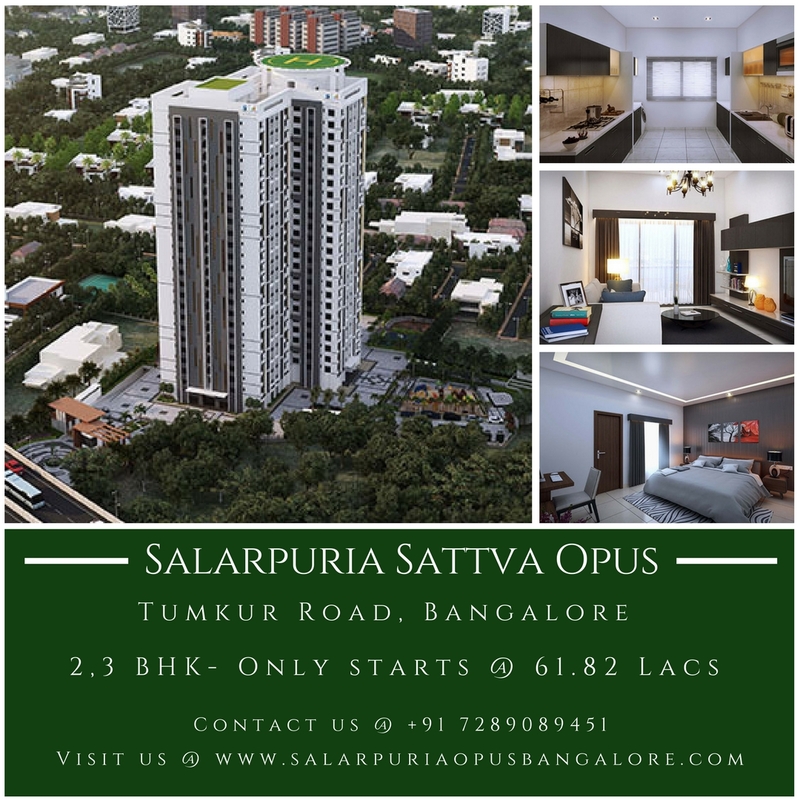 Salarpuria Sattva Opus embellishing Tumkur Road! The premise is lavished amenities available include a multipurpose hall, fully equipped club house, squash court, table tennis, yoga, indoor games room, gym, library, kids’ play area, sky-view blue swimming pool with a separate kids’ pool,amphitheatre, informal jogging track, outdoor gym, cricket practice net and a floral garden. It’s a completely describes home sweet home.